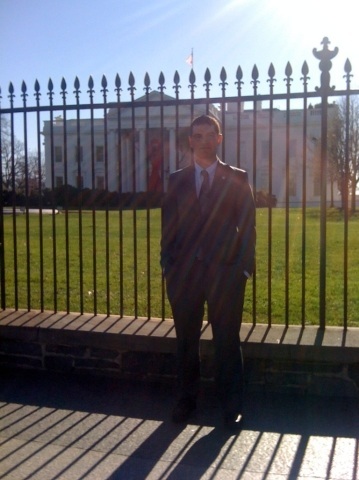 Me standing in front of the White House after my fifteen meeting with President Barack Obama in the Oval Office. Notice the books are missing. They are in the president's hands. As I write this in late February, I am working on a complete account of the once-in-a-lifetime meeting. So far it's about ten pages long. Single-spaced. I'll post when it's ready, hopefully soon. Also, I am waiting for the photos. I had my cell phone and Jen's camera with me, but I was told explicitly to leave them in my pocket when I got into the White House. There was an official WH photographer snapping candids of the president and me. I'm not sure when his office will develop them and send them out. I've heard everything is done with print film so they must be developed the old-fashioned way. And I've also heard (from Jen's aunt and cousin, who met President Obama a few years ago as part of a larger event) that it takes eight months to get pictures back. So hopefully I'll have them by the summer, and I'll be sure to post them here as soon as I do. As always, thanks for reading and I'm very grateful for everyone who helped me on these walks in 2006, 2008, and 2011. Feel free to contact me at highwaytohill@yahoo.com, especially for information on how to walk across America . Up next : writing the book .